The "Oborishte" suffered a total failure of propulsion in Sorel harbour, in pos. 46 02 N 73 07 W, on Apr 21, 2018. The ship was towed to an anchorage for further inspections. 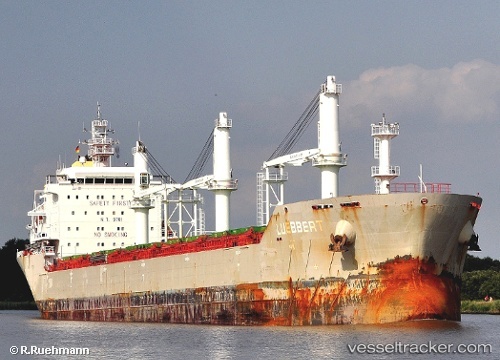 She sailed from Sorel on Apr 28 at 3 p.m.
Bulgarian handysize specialist Navibulgar has completed the purchase of a pair of Chinese-built handysize bulkers from Germany’s MarConsult. The 29,000 dwt Marbacan and Marbioko, have changed hands and been renamed Oborishte and Ludogorets. No price was given by brokers for the transaction. The new additions to its fleets lifts the number of modern bulk carriers in the Navibulgar fleet to around 30 ships, and that is expected to grow further by the end of the year as it takes delivery of more 36,000 dwt newbuildings from China.